Cinema 4D is a popular 3D modeling and animation application. Because of the wide variety of features within the software, there isn't a one size fits all Cinema 4D workstation configuration that addresses all possible workflow scenarios. Within C4D, 3D modeling is a single-threaded task. Unlike Cinema 4D rendering, which is highly multi-threaded, the process of building up your meshes, extruding polygons, and manipulating vertices only uses one CPU core. If you primarily use C4D for modeling, you can’t afford to waste money on a dual CPU workstation with dozens of CPU cores, because those extra CPU cores won’t help you. 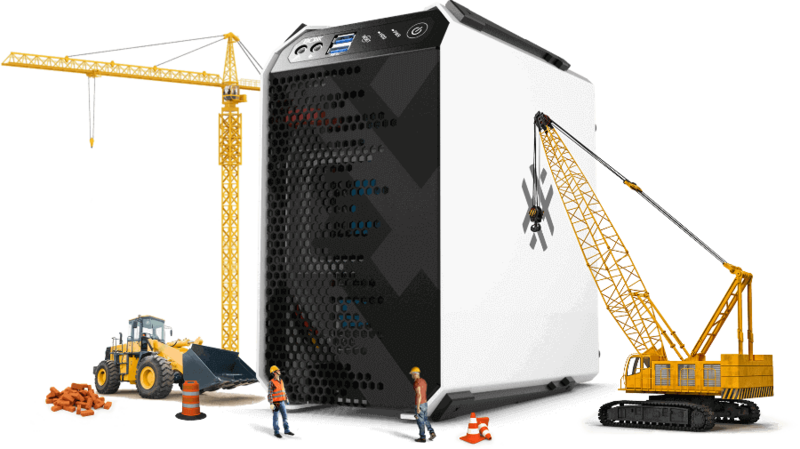 Because a workstation with a high frequency CPU most benefits your 3D modeling workflow, the safely overclocked BOXX APEXX S3 C4D workstation is an excellent choice. 3D animation shares many similarities with a 3D modeling-centric workflow. Like 3D modeling, animation is a single-threaded task, so if it’s your primary task, once again, multiple CPU cores will be of little help. We refer to these types of tasks as “frequency bound” because performance is tied to the frequency of the CPU. Because workstations with higher CPU clock speeds perform better at these tasks, single socket APEXX X3 and APEXX T3 Cinema 4D workstations are ideal choices for animation workflows. As a Cinema 4D user seeking a workstation, you have a variety of rendering engines to choose from. In addition to traditional CPU rendering, GPU accelerated rendering is now at your disposal as well. Whether you are using Team Render, or any of the popular third party engines like V-Ray or Octane, BOXX's C4D workstations have you covered. When choosing your Cinema 4D computer, consider this: Unlike 3D modeling and animation tasks, rendering your C4D assets is a highly multi-threaded process, therefore, the more CPU cores in your system (or systems) the better. The same is true for GPU rendering. For dedicated rendering, BOXX offers a unique desk-side renderPRO 2 for CPU rendering and the APEXX 8R with up to 8 full-size GPUs for GPU rendering.